With the summer months bringing high temperatures it’s important that we keep ourselves and our horses safe from heat-related illnesses such as heat stroke. Unfortunately, when a horse isn’t feeling well from the heat, they can’t express it verbally to us. That’s why it’s imperative to know what causes heat stroke and the signs that your horse might be suffering from overheating. Now, obviously a rise in temperature and humidity can cause the horse to be very hot – just as it does to us. On hot days, make sure your horses have ample access to water so they can stay hydrated and try to keep them in a shaded place with a breeze or fans to help them stay cool. Also, an excessive amount of exercise during the summer can cause heat stroke, so don’t work your horse too hard and if the weather is really extreme maybe don’t have them exercise at all. 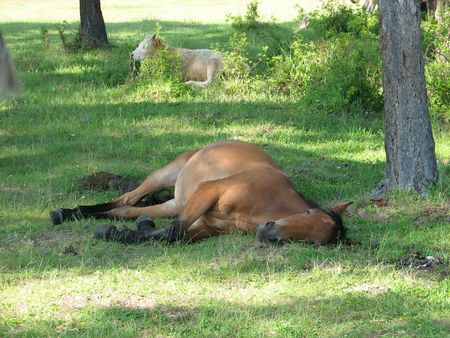 Some horses that have respiratory issues can also be at an increased risk of heat stroke during the hot weather. As we mentioned before, your horse can’t tell you verbally that there’s an issue, so there are some key signs that you should keep a look out for that will help you identify when your horse is suffering symptoms of heat stroke. One sign is if your horse starts becoming lethargic or restless, as this is a way they can express they are uncomfortable and something is bothering them. Another sign is their heart. If your horse’s pulse has become rapid or erratic and they are breathing heavily, it might be time to get them out of the sun as heat stroke may be setting in. Also, keep an eye on their gait – if your horse starts to stumble while walking or collapses, then the summer temperatures have taken their toll. If these symptoms occur, it’s imperative that you get your horse out of the summer heat, start cooling them down and contact your veterinarian right away. Check back next week for even more information on heat stroke, including tips for prevention and treating heat stroke. The portable run-in sheds and horse barns available from Deer Creek Structures will help keep your horse protected from the summer heat. To learn more about our structures, take a look at our online inventory or give us a call at 254-546-2276 today!